Rhea is related to the ostrich and emu and is a large flightless bird of southern South America. The rhea has grey-brown plumage, long legs and long necks, similar to an ostrich. Large males of R. americana can reach 170 cm (67 in) tall at the head, 100 cm (39 in) at the back and can weigh up to 40 kg (88 lb), The lesser rhea is somewhat smaller as they are only 90 cm (35 in) tall at the back Their wings are large for a flightless bird (250 cm (8.2 ft) and are spread while running, to act like sails. 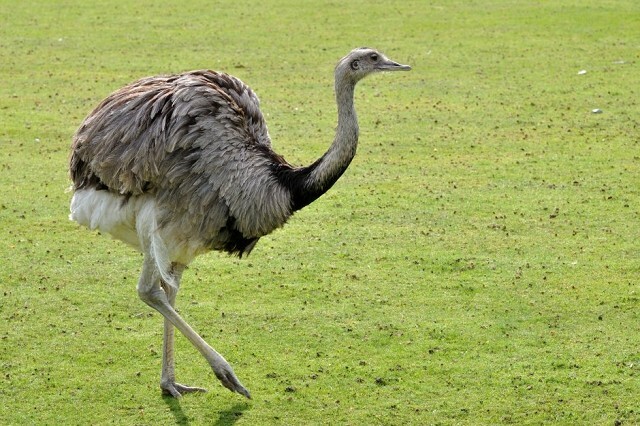 Unlike most birds, rheas have only three toes. There are two extant species: the greater or American rhea (Rhea americana) and the lesser or Darwin's rhea (Rhea pennata). Both are currently rated as near-threatened in their native ranges.